Otone Sonora AV-Lance review | What Hi-Fi? Otone may be relatively new to the audio industry but it has a decent portfolio of PC and iPod speakers to shout about. 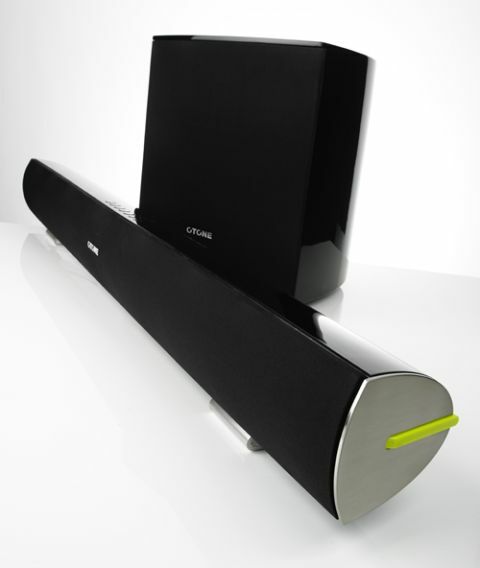 The Sonora AV-Lance is one of two soundbars the company has on its books, the other being the £80 Varsa. Given its appearance and build, there’s nothing about the Otone Sonora AV-Lance that would tip you off that it’s quite so affordable. Both the wireless subwoofer and soundbar unit feel weighty while the gloss black finish looks pleasantly understated. A couple of not-so subtle neon green/yellow go faster stripes add an eye-catching touch of colour. At 11cm tall, the soundbar sits relatively high on its two metal feet – if your TV sits low, you might want to check its suitability. The feet can be unscrewed and the unit rotated for wall-mounting which is a thoughtful touch. If you want to connect external kit, your options are an optical digital input, an analogue stereo input and a 3.5mm auxiliary socket. It’s a pretty basic selection but for this kind of money a forgivable one. Along the top of the soundbar there are buttons for power, volume and switching between sound modes. Beneath the grille lie four 7cm midrange drivers and two 16mm tweeters, while the rear-ported subwoofer uses a 16cm driver. The supplied remote control is on the narrow side and, thanks to its cheap feel, not the most satisfying to use. But at least volume and subwoofer levels can be tweaked from it and you can cycle through the sound modes on offer. One minor bugbear is that there’s no display on the front of this Otone soundbar, so you have to keep an eye on the cluster of lights in the bottom right-hand corner that correspond to different sound settings. It’s a little primitive and can be a confusing at times. None of the sound settings used by the Sonora AV-Lance claim pseudo-surround: SRS TruSurround HD claims to be the most expansive mode, which Otone recommends for movie and TV watching. SRS Wow HD on the other hand is claimed to be the best for music. During testing we found the TruSurround did add a touch of width and give you a slightly broader soundstage: watch Iron Man 2 and Tony Stark flies across the soundstage and ventures slightly further across your listening position than in the standard listening mode. Switch to the Wow HD sound mode, and you get a greater sense of solidity and focus, but explosions sound overly bright. Even though these impacts have greater authority and power, this brashness does prove tiring and distracting over time. For the money, the Sonora AV-Lance is certainly not disgraced. If it could rein in the bright presentation, you’d be looking at a higher star rating.